The Midwinter Convention got off to a great start on Friday evening. After an hour plus of Cabinet meeting, we were definitely ready for some food and the International Food Fair did not disappoint! The participating clubs prepared plenty of food and the variety was outstanding. The only thing that would have made it better would have been a few more clubs participating, but now I'm getting picky. And I can't believe no one chose Mexico as their country! (I really like Mexican food!) 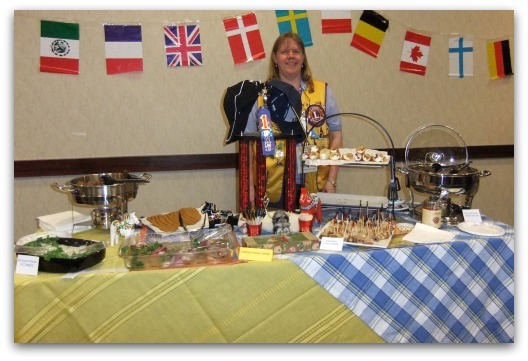 Congrats to Boise Riverside Lions for their winning table of Swedish foods. Really, really good! Lion Angie with the winning entry. Loved those cookies! Many thanks to Wood River Cellars for providing some wines for tasting. If you enjoyed the wine, be sure to visit the winery located between Eagle and Star. Nadine Tackitt and Dale Wilson provided the musical entertainment for the evening. If you would like to schedule them for one of your events, contact Dale at 286-7505. What did you think of the Friday night event? Click the "comments" link below and let us know.